Richard Ned Lebow. The Politics and Ethics of Identity: In Search of Ourselves. Cambridge: Cambridge University Press, 2012. ISBN: 9781107027657 (hardback, $99.00). The broad schema organizing the book is that of three kinds of identity narratives: golden ages, utopias, and dystopias. Lebow in passing acknowledges other forms of identity narrative: creation stories, states of nature, social contracts, and “ideal type deductive systems and genealogies” (53), but he chooses not to focus on these kinds of narratives, despite their centrality to modern political discourse. He rationalizes his choice of golden ages, utopias, and dystopias because of their broad readership, which he infers will offer insight into both elite and popular conceptions of self. The bulk of the book consists of an exploration of these three general categories of identity narratives as they are articulated in an eclectic array of works, including ancient texts of Homer and Virgil, the utopianism of Thomas More, Mozart operas, German idealist philosophy, Dispensationalist Christian fiction (the “Left Behind” series), and a highly selective slice of late twentieth and early twenty-first-century science fiction. Such a diverse array of sources puts a very heavy burden on both author and reader to sustain and follow, respectively, the integrity and focus of the argument. At the beginning of the book, Lebow informs us that the “starting point” of his inquiry is “modernity” in its philosophical, political, and aesthetic forms (3). Much of his commentary is in fact an elaboration on how various writers and artists have reacted to, and in some instances rejected, modernity via the evocation of golden ages, utopias, and dystopias. Lebow distills the core problems posed by modernity as the “quest for individual autonomy” and the “proliferation of roles” (4). The “constituents of internal autonomy” are interiority and reflexivity (4), and thus the key identity struggles faced by modern human beings involve the reconciliation of our interior, reflexive selves and our social, role-playing selves (322), for if we do not reconcile these we face alienation and identity crisis. According to Lebow, human beings deploy four different strategies to reconcile the tensions posed by modernity, and the texts he invokes provide examples of those four strategies: two modern and two anti-modern. One strategy is to reduce tensions between individuals and society by recreating “a world dominated by a religious-based cosmic order” (4); another is to “do away with interiority and reflexivity as far as possible” (5). These are anti-modern strategies evoked by utopian projects such as More’s Utopia and the “Left Behind” series. The latter is the subject of a rather long diatribe and exegesis, for reasons I still have trouble fathoming, since the academics and intellectuals who will presumably be buying The Politics and Ethics of Identity are not likely to be familiar with or interested in the series, and those people who do read the stuff might not be so pleased to hear that the décor of the Millennium is “kitchy” and that “heaven is tackier still” (206). But I digress. The two other, modern, strategies of coping with the tensions caused by modernity seek to either align the reflexive self with the social order by envisioning society as “a source of diverse role models that people can emulate, even mix and match and transform…” on the one hand, or to facilitate a romantic renunciation of society as oppressive and advocate a turn inward, or to nature, in order to develop an “authentic” individual autonomy (5). Both modern strategies involve “self-fashioning,” one through embracing social roles, and the other through rejection of society (5). Mozart’s operas offer examples of role-playing experimentation, while some science fiction dystopias illustrate the oppressiveness of society and its eradication of the individual. If modernity is the starting point, then one may wonder why the book’s substantive chapters begin with Homer and Virgil, but Lebow’s purpose seems to be to use the ancient texts as a counterpoint to modern understandings of identity. He also devotes a chapter to discussing how German idealists viewed the Greeks; in his view, they distilled from the ancients a romantic vision of a golden age, which served as one way of confronting the alienation foisted on them by modernity. Lebow insinuates that this German engagement with the Greeks as a strategy for confronting modernity laid the groundwork for the collapse of the Weimar Republic and the rise of the Third Reich, and he does not absolve German philosophers – even Kant – of their share of the blame, although he does acknowledge that ideas were in many cases manipulated and distorted far beyond and even in direct inversions of their authors’ intentions and meanings. In his words, German “[w]riters, philosophers, and above all, professors and civil servants, became colonized by the state, which employed most of them” (181). With respect to the “ethics” promised in the book’s title, Lebow stresses the ethical consequences of how individual and collective identities are fleshed out. The most important ethical point I was able to glean from the book is that while identity requires an ‘other,’ the assertion of self need not entail hostility and rejection of the other; othering can be integrative. As Lebow explains, “The central psychological dynamic of integration is empathy, defined as the ability to see ourselves through the eyes of others” (314). He illustrates this point with stories from the Trojan war, brief references to Adam Smith’s conception of moral sentiments, Jean-Jacques Rousseau’s Emile, and Orson Scott Card’s novel Xenocide. Instead of resorting to rejection and hostility of others in order to define ourselves, we have the alternative of empathy and integration. This plays out not only in individual relations, but relations between states as well. 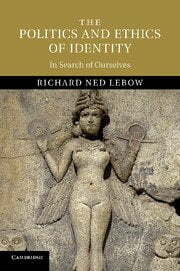 It is certainly worthwhile to be reminded that identity conceptions have ethical consequences, even if one questions some of the generalizations Lebow makes about writers such as Smith, Marx, Kant, Hegel, and Nietzsche – generalizations that are sure to irritate close readers of the actual texts, which are far more nuanced than can possibly be presented in a book of this scope. But Lebow is not interested in close readings of texts for their own sake; his readings serve his argument, and readers must trust him as an interpreter, for he cannot possibly provide systematic evidence for such statements as: “Much of the German philosophical enterprise from Kant on must be understood as a reaction to science and the skepticism and materialism it encouraged” (155), or “Science fiction has been uniformly negative in its assessment of immortality” (234). As a highly sociable, over-50 academic with very little scientific background, I am not sure what to make of the assertion that my love of science fiction groups me with “sophisticated teen- and college-age students with some interest and background in science” and those who are “alienated from society and drawn to texts that hold out the prospect of radical transformation” (230). I can with some confidence predict that those of my colleagues who share my love of sci fi (you know who you are) will be alternately amused and dismayed by Chapter 7 (“Science fiction and immortality”). I do wish Lebow would engage with Neal Stephanson’s Snow Crash and Diamond Age, and was surprised to find absolutely no mention of William Gibson’s genre-pioneering Neuromancer. My broader point is that any attempt to generalize about a whole genre of literature or music or philosophy is likely to engender responses that focus on what was omitted and overlooked. Is it not possible to make an argument grounded in specific textual interpretation without at the same time generalizing about the genre as a whole? Because of its vast range, I suspect readers will find this book difficult to digest. I found myself envisioning it as a series of intense cocktail party conversations, of the kind that leave you both irritated and inspired, drained and energized. In such conversations one may range freely without worrying too much about definitively demonstrating a point. Lebow is without doubt an engaging and brilliant interlocutor, and his intellectual range is impressive. His “conversation” is erudite and at times enjoyable. But The Politics and Ethics of Identity is in serious need of a good editor (I am assuming such beings still exist somewhere in scholarly publishing, but maybe that is another form of utopian fantasy). The core arguments of the book are certainly valuable and engaging, but I would have preferred to read them in a more compressed, tightly-argued form. Mlada Bukovansky is Professor of Government at Smith College. Her research focuses on the evolving norms and institutions of the international system. She has published articles in the journals International Organization, Review of International Studies, Review of International Political Economy, and International Relations. Her first book, Legitimacy and Power Politics: the American and French Revolutions in International Political Culture, was published in 2002 by Princeton University Press, and she is co-author of Special Responsibilities: Global Problems and American Power (Cambridge 2012).